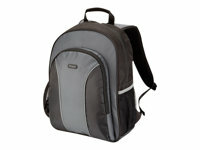 This functional backpac is perfect to carry and protect your 15.4 - 16 inch laptop. With a modern two-tone design the Essential Laptop Backpack offers storage for your notebook computer and daily mobile accessories. Features include specific pockets for pens and pencils, mesh pockets as well as a water bottle holder and enough storage space for your everyday's documents. The laptop compartment is fully cushioned and has a security fastener ensuring your notebook stays firmly in place. A functional solution at the best price.